CBS News has learned that barely five hours after American Airlines Flight 77 plowed into the Pentagon, Defense Secretary Donald H. Rumsfeld was telling his aides to come up with plans for striking Iraq — even though there was no evidence linking Saddam Hussein to the attacks. That's according to notes taken by aides who were with Rumsfeld in the National Military Command Center on Sept. 11 – notes that show exactly where the road toward war with Iraq began, reports CBS News National Security Correspondent David Martin. At 9:53 a.m., just 15 minutes after the hijacked plane had hit the Pentagon, and while Rumsfeld was still outside helping with the injured, the National Security Agency, which monitors communications worldwide, intercepted a phone call from one of Osama bin Laden's operatives in Afghanistan to a phone number in the former Soviet Republic of Georgia. The caller said he had "heard good news" and that another target was still to come; an indication he knew another airliner, the one that eventually crashed in Pennsylvania, was at that very moment zeroing in on Washington. It was 12:05 p.m. when the director of Central Intelligence told Rumsfeld about the intercepted conversation. Rumsfeld felt it was "vague," that it "might not mean something," and that there was "no good basis for hanging hat." In other words, the evidence was not clear-cut enough to justify military action against bin Laden. But later that afternoon, the CIA reported the passenger manifests for the hijacked airliners showed three of the hijackers were suspected al Qaeda operatives. "One guy is associate of Cole bomber," the notes say, a reference to the October 2000 suicide boat attack on the USS Cole in Yemen, which had also been the work of bin Laden. 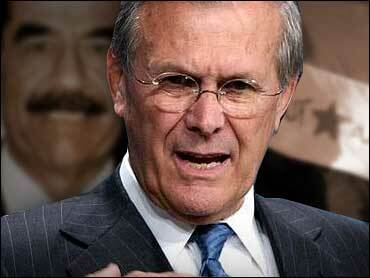 With the intelligence all pointing toward bin Laden, Rumsfeld ordered the military to begin working on strike plans. And at 2:40 p.m., the notes quote Rumsfeld as saying he wanted "best info fast. Judge whether good enough hit S.H." – meaning Saddam Hussein – "at same time. Not only UBL" – the initials used to identify Osama bin Laden.